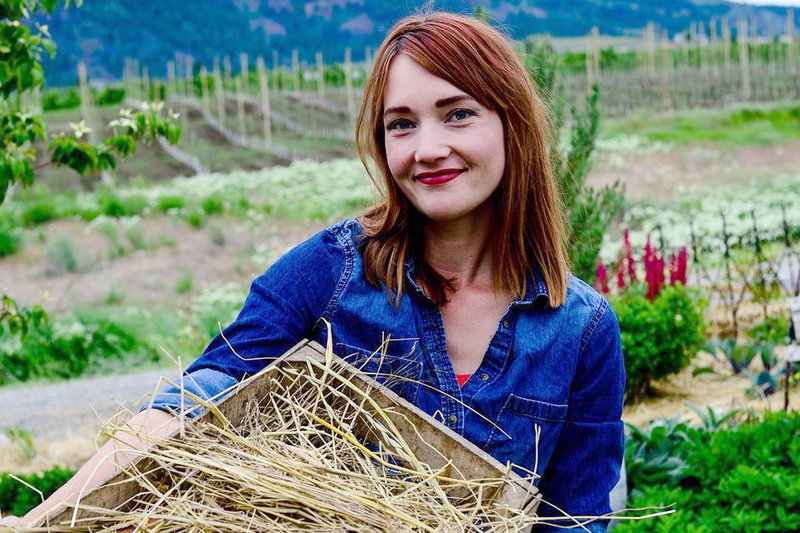 A blogger’s new tell-all book informs, educates, and inspires others to reconnect to food, farming, and the land. A few years ago, Shaye Elliott, feeling trapped in her day job, decided to take a leap of faith. She and her husband packed up and left their city life to a five-acre homestead in central Washington where they raise their own dairy cows, chickens, pigs, sheep, and turkeys, and grow too many vegetables to count. Since 2010, she has blogged about her experiences, building up a following of fellow homesteaders and daydreamers alike. Now, Elliott has a new tell-all book, Welcome to the Farm, written with the hope of sharing tips for other first-time farmers. Elliott has found a great deal of success sharing her life with people through her recipes, videos, and online how-tos. In addition to her popular website, she has sizable followings on Facebook, Instagram, and Pinterest. Clearly, many urban dwellers relate to getting fed up with a 9-to-5 job and escaping to a farm to grow their own food. And while she works hard to reach those readers, the website brings other benefits. 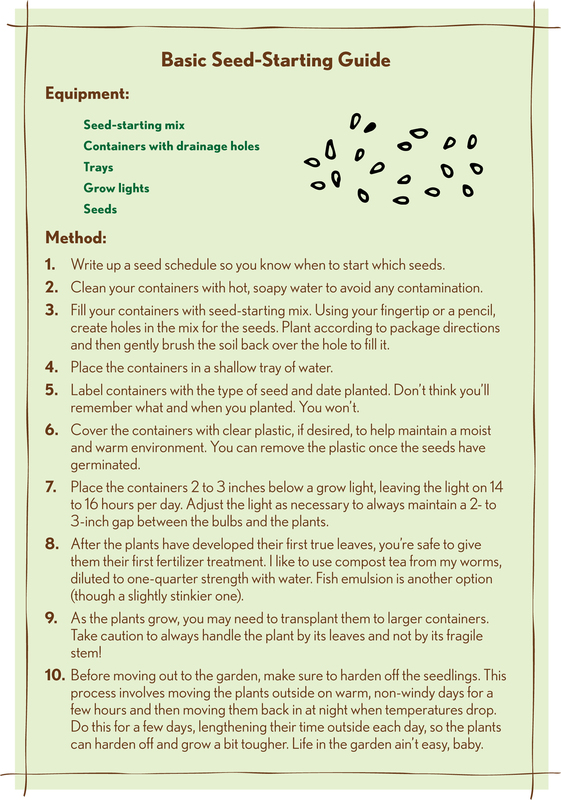 Elliott’s basic seed-starting guide; click the image for a larger version. The effort Elliott has spent building her online audience also helps make her back-to-the-land lifestyle possible, and speaks to how younger farmers are innovating to make their dreams a viable reality. When her first cookbook, published in 2013, sold more copies than she’d expected, she used that money to expand her farm operations. Not every young farmer will find success online and in publishing, of course. But as with Elliott’s blog, Welcome to the Farm breaks things down into digestible tidbits for the armchair homesteader looking to step up their game. For example, she offers a one-page guide on seed-starting to get readers going on their first backyard garden. Elliott’s love of farming and homesteading, and her willingness to share her experiences, encourages people to go the extra mile when it comes to their food. And social media has played a huge role in proliferating that information: No doubt, she has influenced the purchase of at least a few dozen baby chicks by others since starting her blog; her book, seen in the Instagram post below, is also sparking homesteading thoughts among her readers. Elliott said that social media’s power to inform and inspire is particularly true with homesteading. “People who love what they do want to share it with others, and we ourselves are prime examples of that,” she said. Because of this, the good food community as a whole is getting larger as people become more educated about the value of organic produce, raw milk, locally raised beef, and more—all terms that only reached the mainstream within the past few years. By sharing her losses as well as her wins, Elliott encourages people to keep going even when it feels impossible—which is exactly what the industry needs. The last farm census showed a large age gap between young and old farmers, meaning most farmers are finding it challenging to gain a toehold in today’s farm landscape. When she first started, Elliott and her husband endured the same learning curve as anyone who transitions to full-time farm life. But they stayed motivated by relishing the small victories. Once they learned that fresh food really did taste better, how could they stop? And having tens of thousands of online cheerleaders didn’t hurt either. Photos courtesy of The Elliott Homestead’s Instagram. Just watched your show...loved it. You Rock!!! Just happened upon your show on Food Network this morning. Loved it! Hope to see you every Sunday!